My first ‘tangle’ let loose in the wilds..
As I’ve had a chance to delve further into the art of Zentangle® these past few months, I’ve discovered a treasure trove of ‘tangles’ or ‘tangle patterns’, created by others, including Sandra Strait’s daily blogging of the very latest tangles as well as a great resource that keeps growing over at www.tanglepatterns.com. And like most folks that start tangling.. 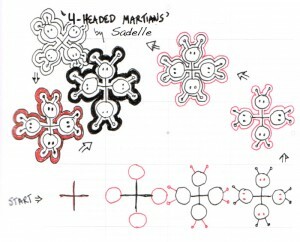 I began seeing inspirations for patterns everywhere and started to come up with a few of my own inspired tangles. So I introduce, my first tangle let loose in the wild… “4-Headed Martians“. After you do a few of these they actually begin to look quite regal and elegant from a distance, yet were totally inspired by whimsy. Have fun, and if you use the tangle, post a link in the comments to your artwork so I can see what you’ve done with it! 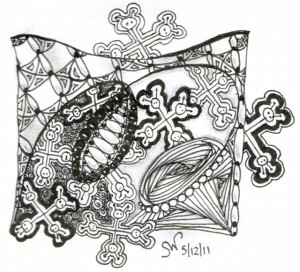 This entry was posted in Tangles, Zentangle®. Bookmark the permalink. 2 Responses to My first ‘tangle’ let loose in the wilds..
What a fun tangle! I wish I could blog it, but blogger has been down since yesterday. I’m going to tweet it, and announce it on Facebook though. Thanks, Sandra.. sorry blogger is down.. (it’s been a day like that for a couple clients too.. ). If you make anything with the tangle, post a link here! And I LOVE your blog and all the great work you do!